5.0 out of 5 stars Captivating! Some books are hard to put down and end up transporting you to another world. The world of magic and suspense, this book did exactly that. It took me to a magical world, an escape that I always seek whenever I pick up a book. Reading for me is like breathing and a book well-written is an addiction and a weakness. I rarely read sci-fi but this book was most definitely worth it. 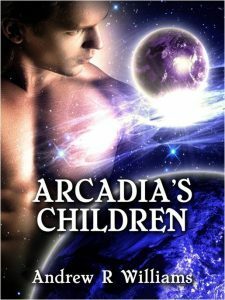 Arcadia’s Children is a sci-fi thriller that kept me hooked till the very end. It was fast-paced and most certainly would not let you get bored. I couldn’t get up without finishing it. There are absolutely no boring moments and is a total page turner and totally recommended if you are into sci-fi or you are looking to try this genre. This is the best book recommendation for people who are new to the genre of science fiction. If you want your friend to join your fandoms from the science fiction world, this is the place to start. I was very pleasantly surprised. This book is exciting, stimulating, and totally captivating. I honestly loved the writing style of the author. It was easy to understand and very smooth. It was just perfect. The writing style and an amazing plotline made it my new favorite and the point of my obsession. This book would totally captivate you and take your place. Careful, it’ll keep you up all night, totally hooked but be assured; it would be totally worth it. If you are looking for book recommendations to gift to a book lover, this book would be your perfect option. I received it as a gift and trust me, I really could not ask for more. It is pure perfection and made my birthday really special. I am sure your book lover friend would totally fall in love with it. I am desperately waiting for the sequel. This book is totally worth your money and your time and you most definitely won’t regret it. This is one of those books that you can proudly make a part of your collection in your library and take it out every now and then. I rarely reread books, but I am unable to put it back on the shelf just yet. Although, I find it difficult reading and being totally engrossed in scientific fictional books. It is not the case with this superb novel “Arcadia’s Children Samantha’s revenge” it is absolutely exceptional as every chapter kept me totally captivated and I could not help but kept on reading. This book is highly recommended as there is no dull moments as Samantha takes on revenge based on crucial information she has to take out her enemy its a must read. What a splendid book and a great story-line. I was in the mood for a different sci-fic this weekend so picked up this book by Andrew R Williams after a friend recommended it to me. This is my first book by this author and I really liked the style. Arcadia’s Children: Samantha’s revenge’s blurb had me intrigued. The story and writing kept me hooked from the word go! It was an exciting, interesting and otherworldly tale. If you are looking for a few hours of binge reading, this book is just right for you. Interesting storyline, advanced droids, secret ops and characters we have only probably imagined and whatnot. I particularly loved Tarmy. What are you waiting for? Grab the book and read to know more! What a great and wonderful book!!! Arcadia’s Children by Andrew R Williams is Very interesting and the story line is superb. I’m highly impressed.